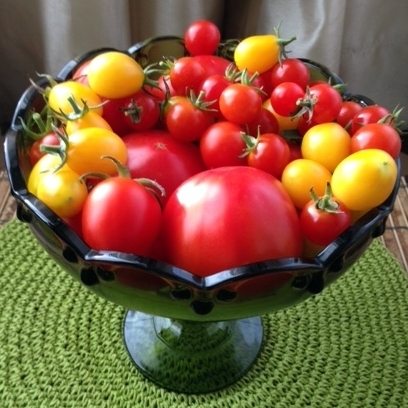 Yesterday I harvested tomatoes from my garden. I have a confession to make. Yesterday, I bought a bag of tortilla chips. 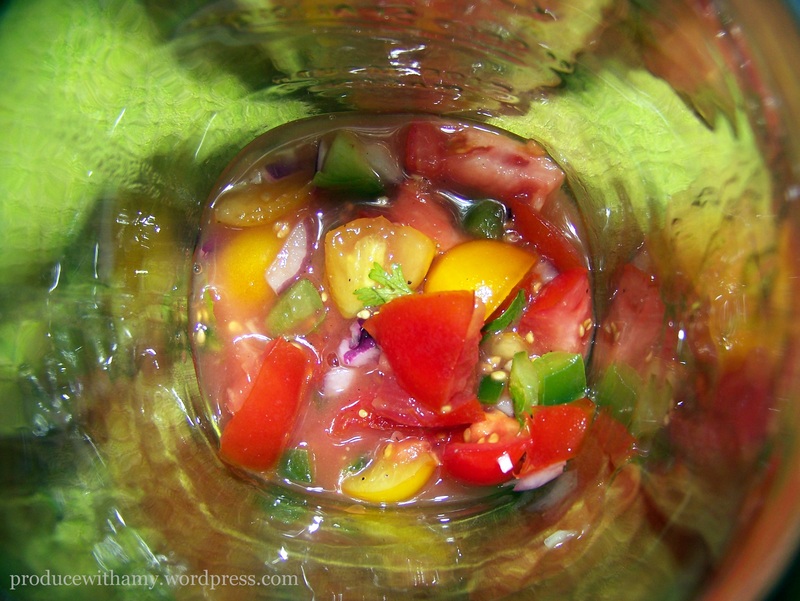 The prospect of the fresh salsa and guacamole that I was making today for my latest Mason jar salad was too tempting. As you may know from previous posts, tortilla chips are my weakness. While I grew up having a sweet tooth, I must say that fresh fruit has replaced chocolate coated sugary treats for me. Yet, I love the salty crunch of tortilla chips. The decision to buy the tortilla chips was not on impulse. It was a well thought out purchase and I will portion out each serving and carefully track in my Weight Watchers eTools account. With week #2 of the school year in the rear view mirror I was faced with some serious self-reflection. The first week I struggled with making time to eat the lunch and snacks that I packed for work and I did much better last week. In the morning I made an extra green smoothie to sip on during my 1/2 hour commute home and this worked marvelously. However, I REALLY struggled with getting to bed early enough to wake up with the energy to exercise. My goal this week will be to get to bed between 10:00 and 10:30 and be up by 4:45-5:00. Eventually, I would like to be to bed even earlier. Baby steps. 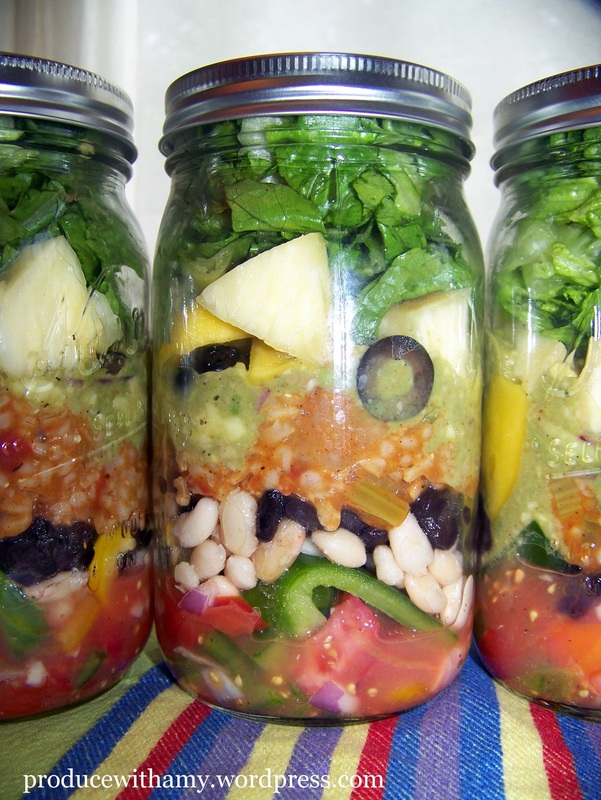 Mason Jar Salads are the perfect lunch to take to work. I love that I can make them on Saturday or Sunday and the last one that I eat on Friday tastes just as fresh as the first. This week I wanted to make sure that my salad was hearty enough to fuel me through an intense teenager-filled-day (all my classes, with the exception of one, have over thirty students with one class roster at thirty-six). When I stopped eating meat, beans became my protein staple. 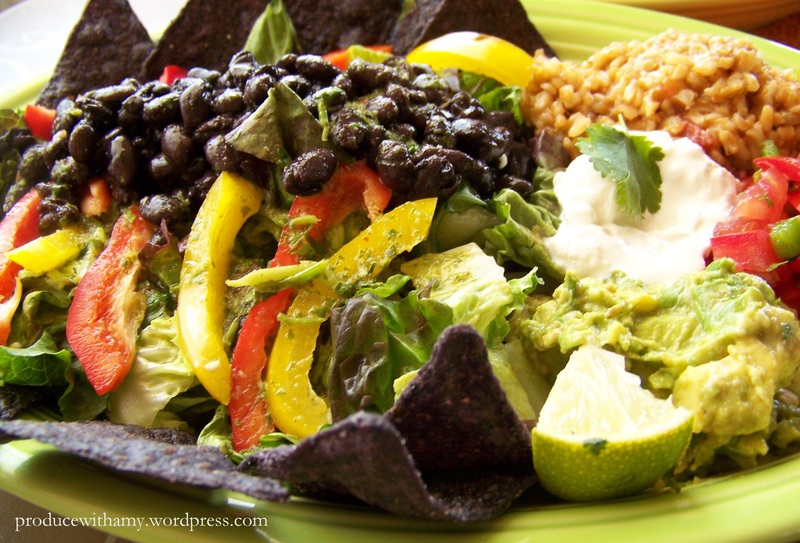 I found Mexican food very easy to work into a plant-based meal plan (thus, began my tortilla chip obsession). I decided that one of my go-to salads could easily be converted to a Mason Jar Salad. 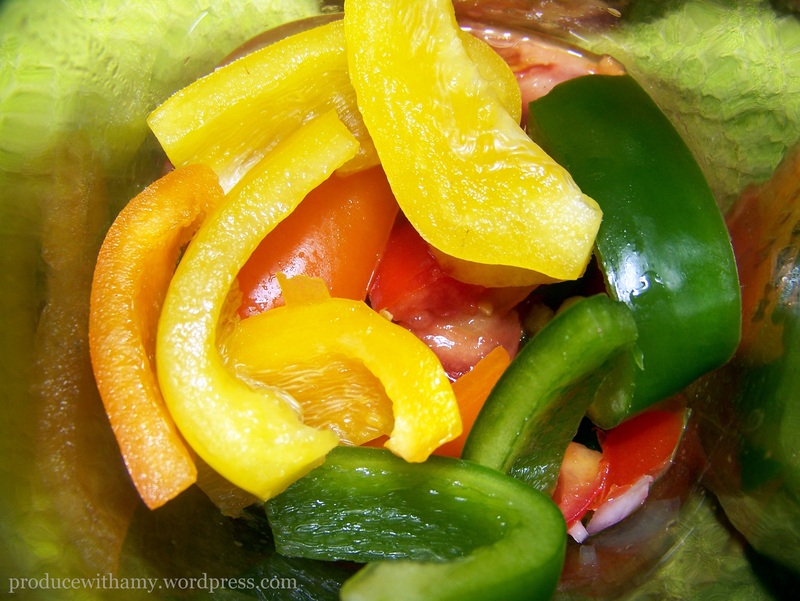 I love the crunch and nutritional boost that bell peppers provide. They are high in Vitamin C which is so important for our immune systems this time of year. Since I consider the Mason Jar Salads a meal, and not just a side item, I do not go skimpy on the protein and other ingredients and my jar salads are usually 7-10 Points Plus value. I do have pint-sized jars that I use to make dinner/side salads and those are usually only a couple of Points Plus each. 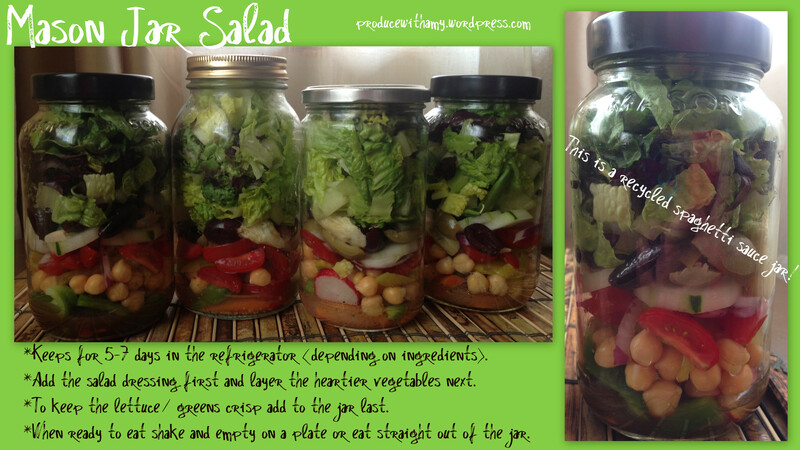 Easily the Mason Jar Salads can be tweaked to meet your specifications. It is amazing how much produce you can stuff inside a one quart jar and it FILLS a large dinner plate. 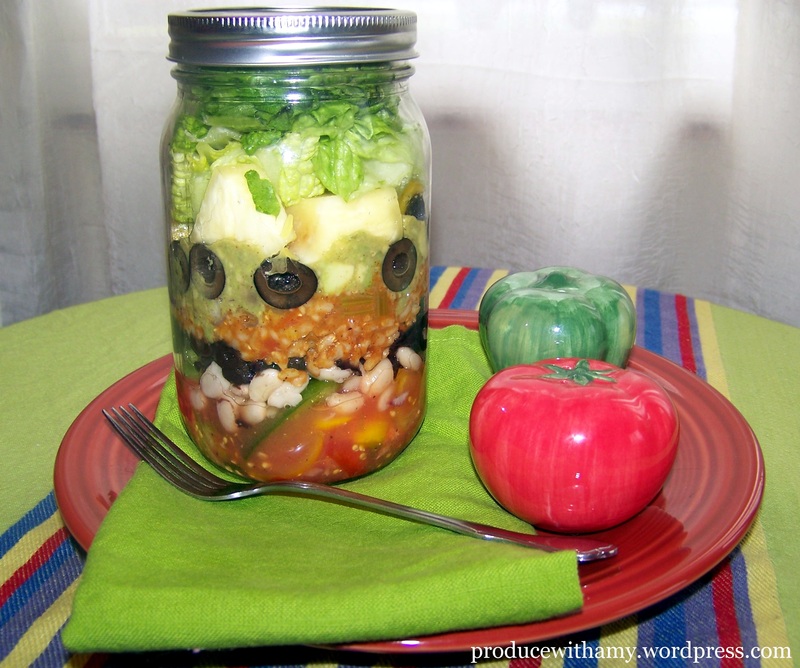 Jarred salads are a fantastic way to meet your fruit and vegetable Good Health Guidelines. This summer I made a plated version of this salad with homemade Cilantro Lime Vinaigrette Dressing. This dressing would be a great addition to this Mason Jar Salad but I thought that the juicy salsa and creamy guacamole would suffice. If you are interested in other Mason Jar Salads, please check out my other salad recipes.You can follow my recipes on Pinterest and please like my Produce with Amy Facebook page. Now that my blog is written and I earned a sticker on the calendar for the Fall Forward Healthy Lifestyle Challenge (It is not too late to join) I am going to have a mid-day snack of salsa, guacamole, and tortilla chips. 😉 I hope you are spending your Sunday exactly as you wish ~ relaxing, watching football, or maybe checking off your own to-do list and recharging for another busy week. Remember that food is fuel and make sure you fill your plate (or jar) with an abundance of fruit and vegetables. I promise to keep the Mason Jar Salad recipes coming! 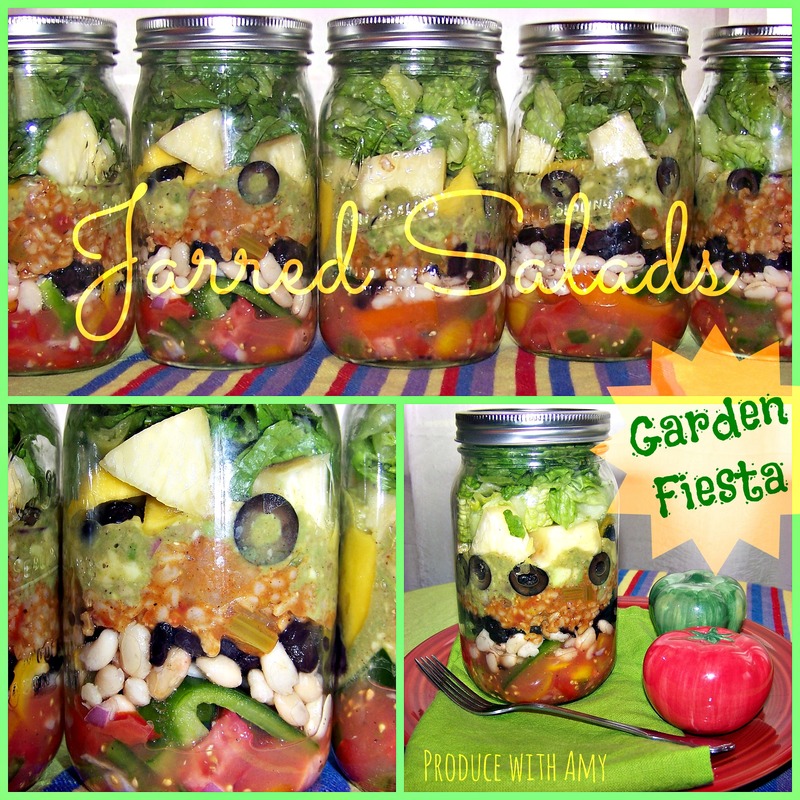 This entry was posted in Uncategorized and tagged Avocado Recipes, Garden Fiesta Mason Jar Salad, Homemade Guacamole, Homemade Salsa, Mexican Salad, Plant-Based Mason Jar Salad, Vegan Mason Jar Salad, Vegan Salad, Weight Watchers by Amy. Bookmark the permalink.